Drivers have been warned to drive with caution as snow and ice affect large parts of Scotland. Dozens of schools have been closed in the Highlands and Dumfries and Galloway, after overnight snowfall. And motorists are facing difficult white-out conditions on roads across the country. A Met Office yellow warning of snow and ice has been in place since Monday evening, after an icy front arrived from the Atlantic. Snow and sleet affected many roads including the A9, M9, M80, A720 M77, A7 and the M73. The A9 at Dalwhinnie was closed for about two hours after a lorry jackknifed near the snow gates at about 05.45. Thundersnow was also forecast, with a warning that power supplies and mobile phone coverage may be affected. More than 30 schools have been closed in the Highland Council area, including Kingussie High school and Glen Urquhart High School. Lockerbie Academy and Moffat Academy are among a series of schools which are also closed in Dumfries and Galloway. Schools have also been closed in the East Ayrshire and Stirling Council areas. Dumfries and Galloway College has cancelled classes at its Dumfries campus but the building is open. A number of school bus routes in the Scottish Borders and South Lanarkshire have been cancelled but the schools are open. Drivers and those using public transport have been warned to expect delays. 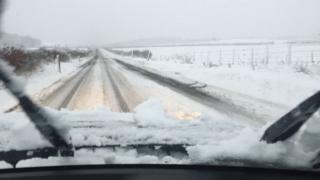 Stein Connelly from Traffic Scotland told BBC Radio’s Good morning Scotland programme: “We’ve experienced some challenging weather conditions through the night and into the morning peak. “Overnight there were -5.5 degree temperatures [in some areas]. We had 148 gritters out and we are seeing some heavy snowfalls on some of the routes so it’s challenging driving conditions just now. Traffic Scotland tweeted an image of the early-morning white-out conditions on the M8 at Easterhouse, and assured motorists that gritters were working hard to keep roads open. In the south-west of Scotland, there were reports of lorries getting stuck in snow on the A709 between Torthorwald and Lochmaben. Heavy snowfall is also affecting the A7 north of Langholm, and sections of the A76 between Dumfries and Kilmarnock. Glasgow Airport was also closed for a while as the runway, taxi and passenger routes were cleared. The yellow Met Office alert began at 18:00 on Monday, signalling three days of “frequent and heavy hail and snow showers”. The chief forecaster said snow would be at its heaviest and most frequent across the west of Scotland. Road operators Bear Scotland and Scotland Transerv said gritters had worked overnight to treat routes. Between 10-20cm (4-8in) of snow was expected on higher ground in Scotland. At low levels, snow fall of between 2-8cm (1-3in) will be more typical, though some parts will see very little at all. Northern and western Scotland could also see hail and lightning at times, the Met Office added. There was also potential for blizzards and drifting snow, as strong winds were also expected, particularly over higher ground. Forecasters said a few rural communities may become cut off. In addition some roads and pavements will be icy, increasing the chances of accidents or injuries. BBC weather presenter Christopher Blanchett said the heaviest of the snow showers were expected “well after dark and most likely through the early hours”. He added: “Drifting is likely on higher road routes and high ground. Tuesday morning’s commute may be difficult in places – where the showers occur.